Input: VGA/AV/USB/SD/HDMI(Data cable not include). 2. Image: JPEG, BMP, PNG. 3. Video: MPEG1, MPEG2, MPEG4, RM, RMVB, AVI MKV, MOV. The battery model of the remote control AAA/UM4/LR03. 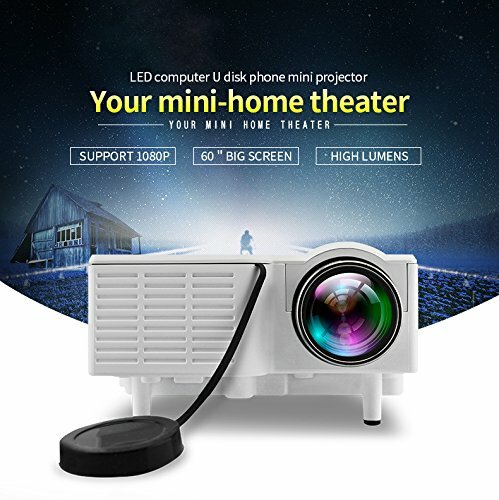 This projector only suitable for dark place personal entertainment cinema, notsuitable for business, teaching, presentation PPT documents, etc. where stronglight during the day, not a substitute for computer monitors, replace TV. Beautiful and generous in design and the pico projector is small and light and easy to carry to where you want. Manual focus adjusting, get picture from 20 to 60 inches, Easy changing in 16:9 and 4:3 aspect ratio; Low power consumption, echo-oriented.